The only late-ripening of all Apricot varieties, the Autumn Royal is aptly named for its medium-sized, oval-shaped fruit, which ripens in September. The fruit has a firm, pale orange, juicy flesh that is great when eaten fresh, canned or dried. The fruit of the Blenheim Apricot is known for its golden yellow and blush-colored skin, and complex, sweet-tart flavor with notes of honeysuckle and honey. Maturing up to 25 feet in height, the Katy Apricot tree requires full sun and medium water with good soil drainage. Its fruit, which ripens earlier than other varieties in June, is large and extremely flavorful. 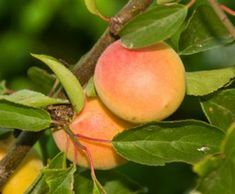 The Royal Apricot tree produces a highly popular, visually appealing fruit, with smooth, pink-yellow skin and a delicious taste that works well in a variety of baked goods, as well as in refreshing exotic cocktails. Peacotum is a complex hybrid that includes apricot, plum, and peach in its parentage. Slightly fuzzy, like that of an apricot, it is bright yellow with an attractive red blush. The tart skin gives way to a mildly sweet amber flesh for a delightful eating experience. Naturally a semi-dwarf tree. The semi-dwarf Cot-n-Candy Apricot tree blooms very early, and grows well in moderately fertile soil that is adequately drained. Its fruit is visually quite similar to that of other Apricot varieties, however their taste is distinctly different, delicious and lingering.